Tremendous time last night in Syracuse, as Brannock Device Night was a huge success. That’s me in the center of the photo shown above, flanked by Phil on the left (who drove up all the way from Long Island) and Sportslogos.net poobah Chris Creamer on the right (who drive down all the way from Toronto). It was awesome having both of them on hand for this special night. I want to thank all the readers who showed up at the ballpark, including Doug Brei and his charming stirrups-clad daughter, Maddie; Bill Emigh; David Sonny and his lovely family (who came all the way from Cincinnati! ); T.J.; Joe and Nicky; and the many other people whose names I can’t recall now. It was a really wonderful night — thanks so much. I also want to thank the Chiefs, especially GM Jason Smorol; graphics and social media director Danny Tripodi; merchandising director Katie Berger; equipment manager Jody Pucello; ticket sales director Will Commisso; and media relations honcho Michael Tricarico, all of whom were terrific. The rest of my day was sensational, highlighted by a tour of the Brannock Device factory, which was pretty much a geekfest of epic proportions for me. I’ll have more to say about all of that later. By the time you read this, I’ll already be on a plane heading back to NYC, so please forgive the brevity of today’s post. We’ll get back to more substantive content tomorrow. Baseball News: The Dodgers called up P Dennis Santana on Wednesday, and he brought Triple-A teammate Yimi García’s glove with him (from Stetson Pevear). 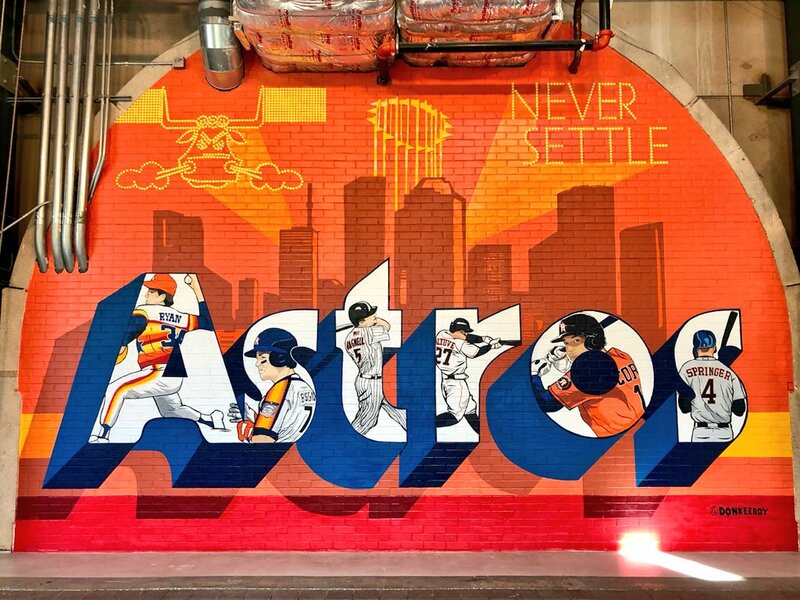 … There’s a sweet new mural in centerfield at Minute Maid Park (from Ignacio). 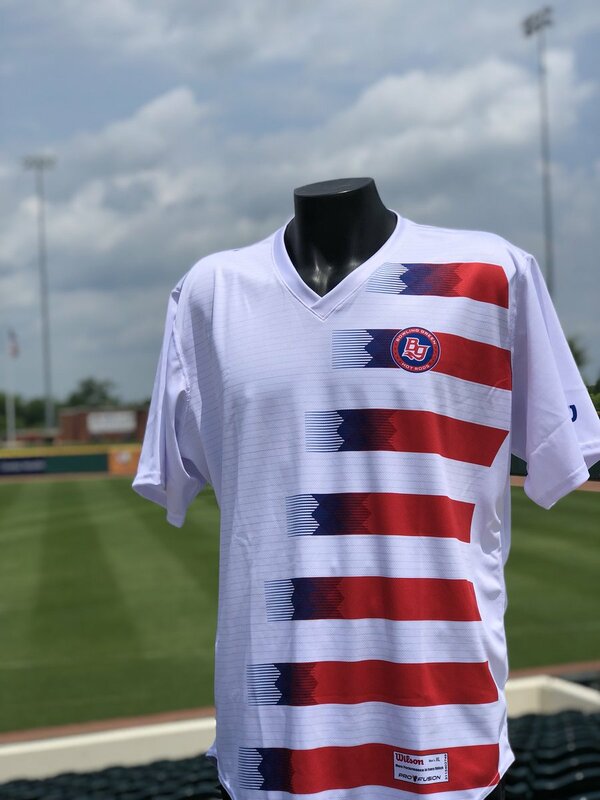 … The Bowling Green Hot Rods poke fun at USA soccer with their “What Should’ve Been” jerseys (from Kyle Wolz). … The Memphis Redbirds will play as the Memphis Música on Wednesday (from Trey Morgan). … Here’s how the Sussex County Miners looked on Star Wars night (from John Cerone). … According to a Reddit post, Arkansas can no longer wear their white jerseys or pants because they got turned pink in the wash (from Sean Patton). … We had a color-on-color matchup between Oregon and Arizona State from the Women’s College World Series yesterday (from Jeffrey Seals). 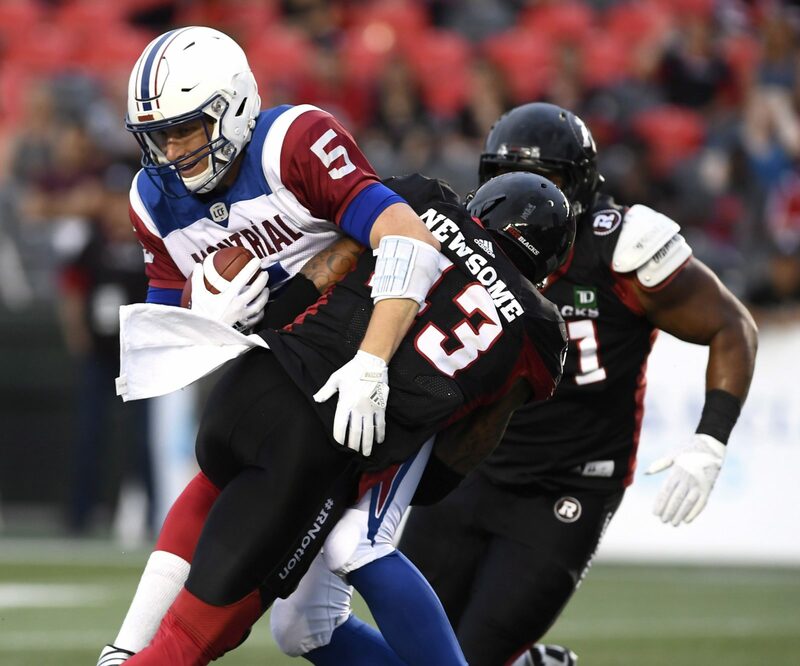 Football News: The Montreal Alouettes plan to change their helmet logo every month as part of an effort to create a more attractive stadium culture (from Moe Khan). … Speaking of the Alouettes, we had a NOB misspelling last night (from @habspats18). Hockey News: The Hurricanes will give a first look at their third jersey on June 22 (from Ed Hughes). … From the 1968-69 Penguins media guide, Jean Pronovost’s jersey logo was falling off (from Kevin Vautour). NBA News: LeBron’s outfit before last night’s Game 1 of the NBA Finals was … something (from Jared). … Speaking of LeBron’s style, he, Kevin Durant, and James Harden wore generic jerseys in a commercial (from NYCKING). … Basketball isn’t big in Samoa, but NBA jerseys are (from Mike Chamernik). 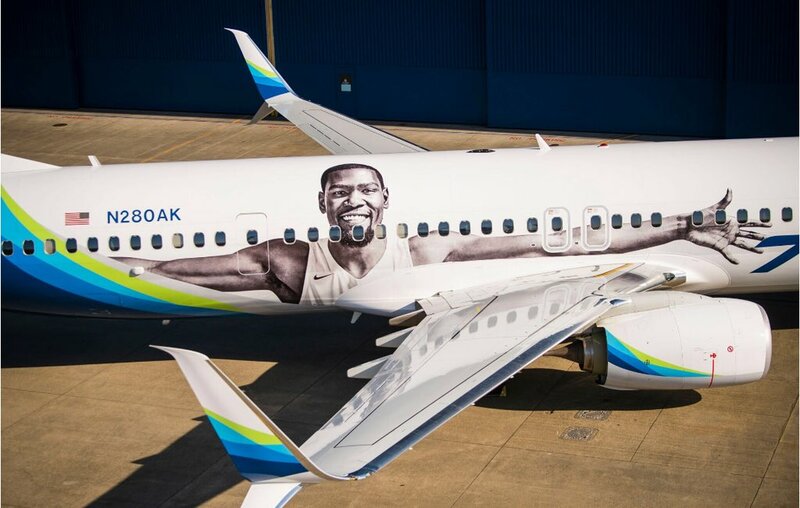 … Kevin Durant is now on the side of an Alaska Airlines plane. 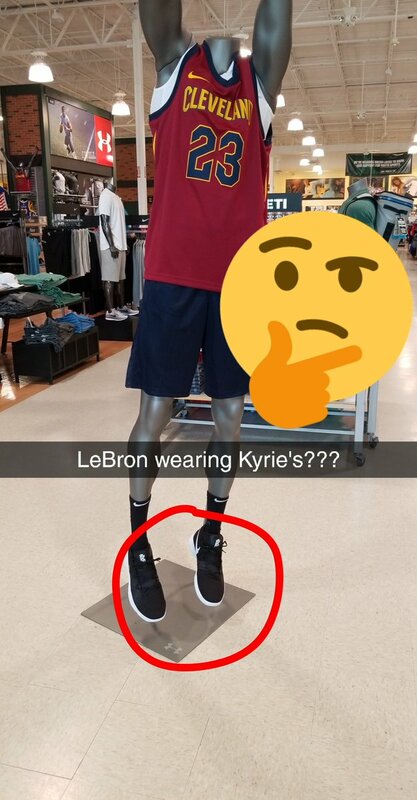 … Brian Petree found a mannequin wearing a LeBron James jersey and shoes of his former Cavs teammate, now Celtic Kyrie Irving. … It was originally reported that Fiserv, a tech company, was nearing a naming rights deal for the new Bucks arena. But Fiserv is now denying those reports (from our own Alex Hider). Soccer News: CD Leganés is celebrating their 90th anniversary with a lace-collared traditional away kit (from Ed Żelaski). … The Bowling Green Hot Rods poke fun at USA soccer with their “What Should’ve Been” jerseys (from Kyle Wolz). … The next few are from Josh Hinton: Slovakia’s official 2018 home and away kits were unveiled. … The MLS All-Star shirts and new home kit for Ajax was leaked. 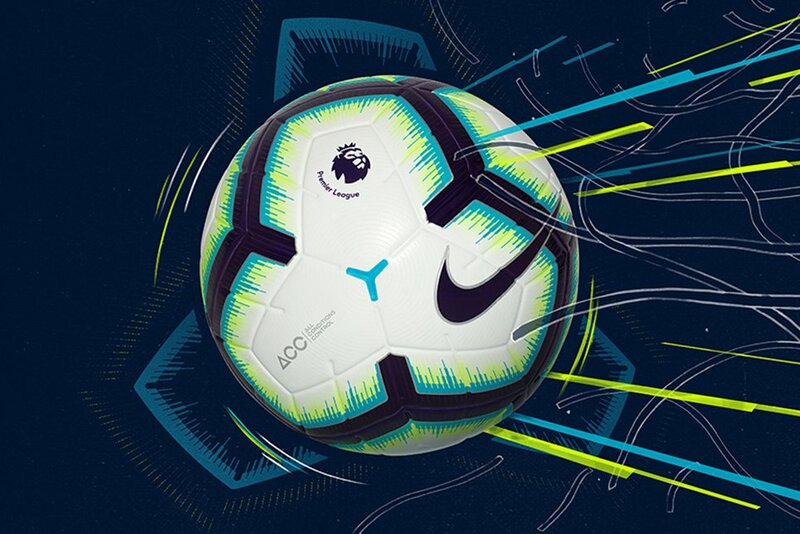 … Here is the new Premier League match ball for 2018-19. … The US Open Cup’s tweet about 4th round matchups uses an old Louisville City FC logo. … New home kit for San Marino (from Ed Żelaski). … Portland Timbers defender Zarek Valentin will wear a bow in his hair if he gets 10,000 retweets (from Kenny Ocker). 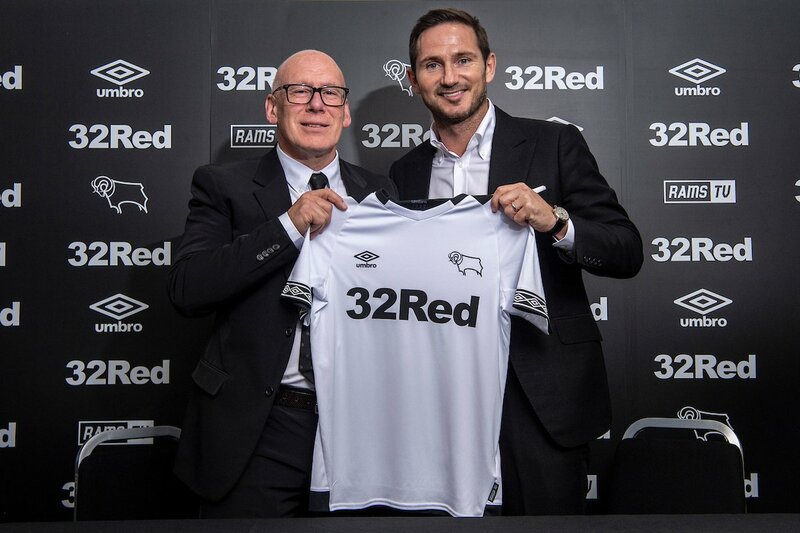 … Derby County unveiled their new home kit yesterday (from Ed Żelaski). Grab Bag: Two high schools in Elkhart, Indiana, are consolidating into one, so students got to vote on the name, mascot, and colors of the future school (from Terry Mark). … Edinburgh Rugby has undergone a total redesign (from Eric Bangeman). 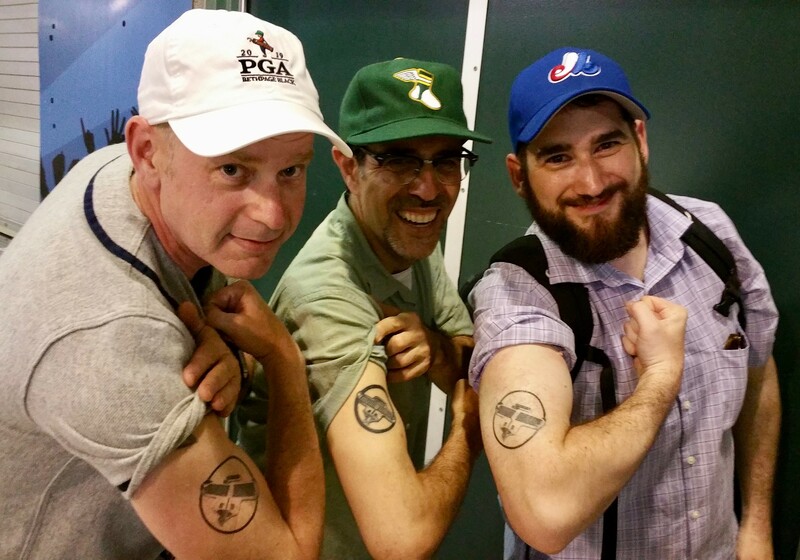 … Band Trouble Funk performed a “Tiny Desk Concert” at NPR in matching baseball jerseys (from R. Scott Rogers). Paul, that pitch made Jamie Moyer proud. Well done! Louisville City FC, not Louisville FC. What happened to the Arkansas jerseys happened to my high school’s jerseys way back in 1975. We’d gotten some beautiful new doubleknits for the D.C. Everest Evergreens of Schofield, Wisconsin, but the forest green tops ran in the wash. So it was back to the ancient flannels. Proofread re: the Montreal Alouettes. The article states that they plan on using a different helmet logo each month, not each week. 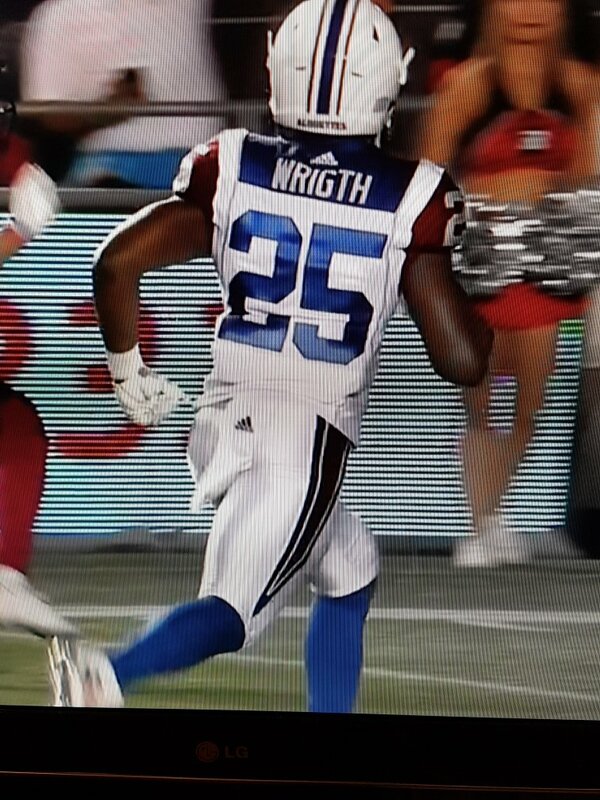 Notable at the pre-season game in Ottawa last night, the Alouettes wore no helmet logo. Sounds like a really fun night! And a perfect first pitch. Impressive first pitch Paul, way to go! Pretty awesome that you were reunited with a childhood friend you hadn’t seen in 40 years, great story! Congrats to Paul on a successful first pitch and a fun idea executed. It was especially cool to hear you saw an old friend from 40 years ago. Props to a Madison, WI, curling buddy, Anthony Frey, who shared the Trouble Funk video with me in honor of the Caps victory in Game Two of the Stanley Cup Final. Frey adopted the Knights for the playoffs, but knows I’m a huge Caps fan. Re: the Bowling Green Hot Rods dressing as the USMNT. It’s not really “what should have been” if it’s what is. They’re simply wearing the USMNT shirt, which is being worn this week and will be for the next two years or so. It’s not so much a matter of whether they’re wearing it but where. Nice job with the first pitch! Looked like a perfect night. Great job on the pitch! Almost looks like you threw a curveball. Nice job on the pitch! “Come on now, boy, give it to him! That’s the old pepper, boy. That’s putting it over the old plate, boy. Back around 1970 I had a little league coach who actually thought “chatter” helped us win games. Paul, you can now watch those “worst ceremonial first pitch” videos and laugh at the likes of 50 Cent and Carl Lewis, because that ball you tossed was perfect! If only that WAS Bugs Bunny behind the plate…. Great pitch, Paul! And from the edge of the mound, too. All he does is throw strikes!! Nice first pitch considering the pressure! I wish I had one of the splashy neon third kits from three or so years ago. I seem to remember the Lakewood BlueClaws wearing a U.S. jersey about five years ago. The blue body and white sleeves one, not the “Where’s Waldo?” kit. That Trouble Funk band sounds like what the Super Bowl Shuffle wanted to be, but couldn’t. For those wondering in regard to Phil’s trip (who drove up all the way from Long Island) and Chris Cramer’s trip (who drive down all the way from Toronto), the shorter trip according to google maps (not completely reliable) was Chris’s clocking in at 5 hrs and 2 minutes vs 5 hours and 9 minutes for Phil’s, a massive 7 minute differential, albeit Chris’s trip had to deal with customs. Nice first pitch. Thanks for doing it from the grass right in front of the mound instead of from the rubber. The way you did it was the right way. Just a bit outside. He tried the corner and missed. No mention of the Tug Boat Captain’s ball cap? Paul, you know I love ya, but damn if the Brannock device obsession isn’t the dorkiest thing ever.